Brewpubs will always have a special place in the hearts and stomachs of DC, especially the likes of Bluejacket, Right Proper, and Mad Fox, but this here manifesto is about celebrating the cozy beer authorities that have CURATED killer lists that will keep us coming back for suds all winter. Introducing the 12 best beer bars in DC. ChurchKey is worshipped for its draft selection. How could it not be with 50 offerings stored at three different temperatures? But, the bottle program deserves your attention in a big way. As of Oct. 2015, Beer Director Greg Engert had accumulated 668 bottles, 80 of them being reserve vintage beers. In case you’re geeky about numbers like Engert, here’s a crazy stat. “We have about 3,000 bottles of beer that we’re aging currently, like vintage beers that stretch back to the 2000s, and one back to 1997,” he says. That’s hard to wrap your head around, we know. Recently they’ve ramped up their tart and funky sour beers (so hot right now), and currently have 200 by the bottle or on draft. To really cash in on what ChurchKey has to offer, check their Facebook page frequently. 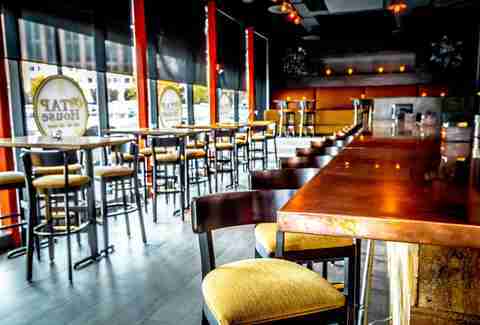 The bar does 8-10 beer events per month. We asked ChurchKey Beer Director Greg Engert to name another beer program that shines, and he named Jack Rose beer man Nahem Simon because of Simon's prowess as a beer caretaker (meaning you always get a perfect pint). That’s high praise. Nahem hand-built a 20-line, surgical-grade stainless steel draft system he maintains with OCD-level attention. 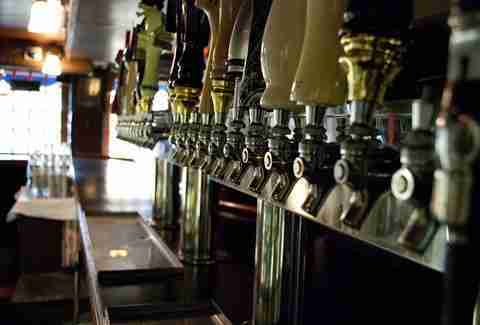 (He even co-launched a draft line installation company to help other bars achieve similar perfection.) The beer collection privy to these lines features accessible yet esoteric beers, along with rare finds. Peruse the draft list, plus 40 large format bottles, and don’t be shy about asking for off-menu brews. Obviously, there are barrel-aged collaborations given Jack Rose’s status as a whiskey museum, including this new one: “We shipped our bourbon barrels to Belgium’s Brasserie de Silly to age a special Scotch ale, bridging the Old World tradition of Belgian family brewers with New World American bourbon distillers,” Simon says. Sounds tasty. 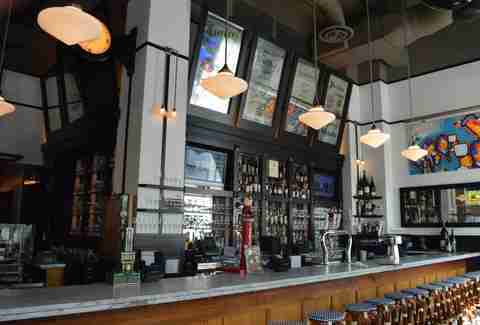 Housed inside Pizzeria Paradiso Georgetown is Birreria Paradiso -- a craft beer lovers paradise that snagged the 2015 RAMMY Award for best beer program, beating out Bluejacket, among others. Some highlights of the diverse program include an ongoing collaboration with 3 Stars Brewing Company, a stand out cellaring program for aged beers, and a lot of heart. Every year, Birreria Paradiso teams up with DC Brau and Bread for the City to feed those facing poverty. They use spent grains from DC Brau to make pizza dough and donate proceeds from sales to Bread for the City. Finally, Birreria Paradiso is not afraid of hard work. “We are still one of the few beer bars who are able to get Cantillon, for example, and are willing to pull all-nighters to drive across the country to get beers that otherwise wouldn’t be available in the area,” explains Executive Beverage Director Josh Fernands. Meridian Pint has all the bells and whistles to make it a prime beer destination from pour-it-yourself tap tables and a drool-worthy draft list that’s 20 lines long and updated daily online to 60+ bottles spanning the country. 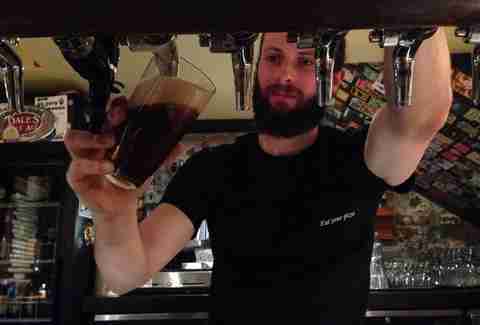 After all, the bar is dedicated to American craft beer, so don’t expect anything nuts from Germany or Belgium. There are also fun diversions including flat screens galore and brand new arcade games that replaced the shuffleboard tables. So go ahead and play some Ms. Pac-Man with an Ommegang Art of Darkness close by. If you dig Meridian Pint, don’t miss the similarly stocked sister bars: Smoke & Barrel and Brookland Pint. 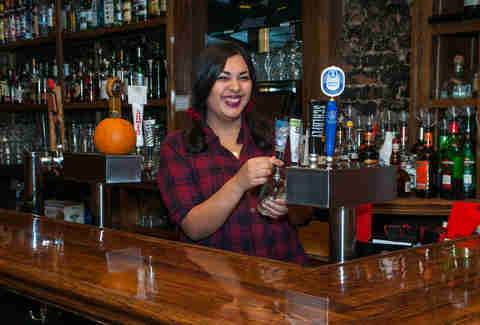 The Black Squirrel serves up a serious selection of beer, but without pretension -- something customers have come to appreciate. 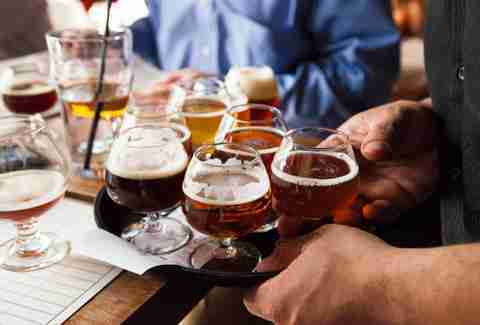 Roll in with a group of buds that are a mixed bag of craft beer newbies and aficionados, and everyone will feel stimulated thanks to a draft list of 57 beers and 60 bottles to boot. They also slay it at boisterous beer events. “You can count on at least one off-the-chain beer event a month from The Black Squirrel,” Owner Amy Bowman. 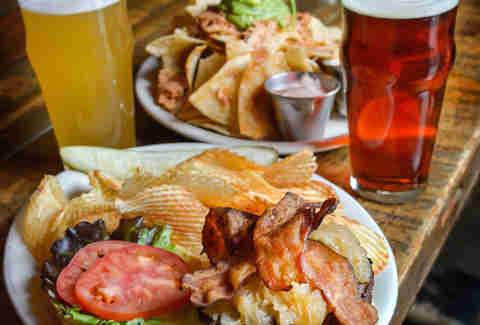 The other thing The Black Squirrel excels at is beer’s food-match-made-in-heaven: burgers. They’re all hand-ground and spiked with duck fat. Belgian beer freaks can really feel at home here, because there are more than 140 bottles of Belgian ales, plus a dozen drafts all curated by a bona fide Belgian -- Chef Robert Wiedmaier. You know, the guy that’s been deemed an honorary beer knight by the Brewers Mash staff in Brussels and who has his own Belgian double blonde ale called Antigoon. Within the general Belgian category, there’s something for everyone: saisons, blondes, dubbel ales, Belgian IPAs, sweet lambics, and bière bruts. To save some dough, visit during happy hour when there are both $5 and $3 rotating specials. Also badass and Belgian (like Gotye) is Granville Moore’s. The gastropub typically pours around 100 imports including a healthy array from Trappist brewers like Achel, Chimay, Orval, Rochefort, and Westmalle. If Belgian beer isn’t your thing and local beer is, visit during 5pm-7pm happy hour (Sun-Thurs) when local beers from DC, Maryland, and Virginia are $6. 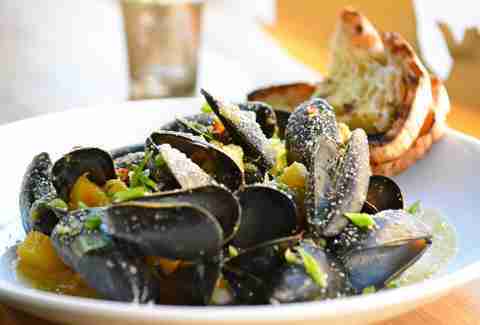 Things change quickly here, so don't order before checking the blackboard, and don’t forget to order mussels to munch on alongside your beer that likely has a high ABV. Adjoining restaurants District Commons and BTS share a 1.22-mile long beer line. That’s longer than you jogged this morning, let’s be honest. If that wasn’t impressive enough, there’s the stunning glass-paneled beer case showcasing District Commons selection of 99 bottles of beer (kitschy but we forgive them). If you work your way through them all, you’ll be welcomed into the 99 Bottles of Beer on the Wall Club with a plaque on display. The drafts are domestic, and pull from the best beer-producing regions of the country like Colorado, Illinois, California, and now Virginia (whoop whoop!). Don't’ forget those keg killers the first Monday of every month when craft beers are $3 starting at 6pm. 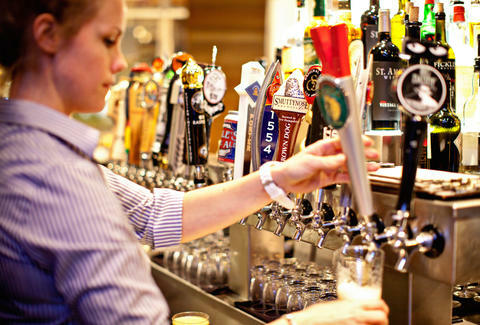 You’re helping the bar clear their lines before they’re cleaned and refilled with fresh offerings. Beverage Director David Donaldson has to print beer menus every day at City Tap House because he says 25 of the 40 draft lines, including two casks, are “rotated aggressively.” Of the core list, however, Donaldson’s favorites include Schneider Aventinus and Weihenstephaner Hefeweissbier from Germany, Flanders red ale from Belgium, and Hitachino Nest white ale from Japan. The cask program is capable of producing some cool suds thanks to collaborations with breweries like 3 Stars Brewing Company, Heavy Seas, and Oskar Blues. 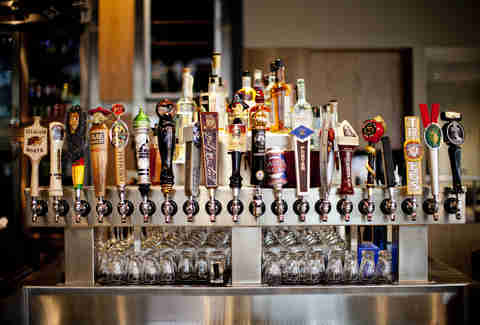 Finally, look for noteworthy tap takeovers. During Savor, they did a 40-line takeover by Dogfish Head, which meant the brewery had to dig real deep. While the beer program at Roofers Union is serious in terms of quality, they also don’t take themselves too seriously. Drafts are divided by sassy categories like “Weirdly Awesome” and “Heavy Brooding,” helping you to make a selection. 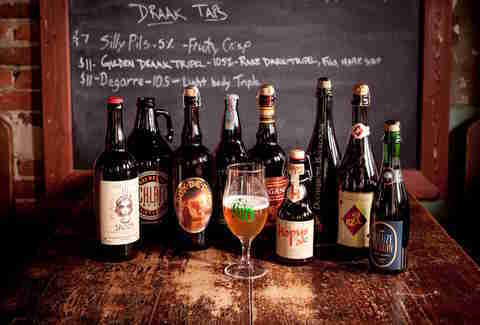 Dave Delaplaine’s list also includes insightful tasting notes, a hefty cellar category of aged beers, and nitro pours. Can’t make a decision? We don’t blame you, there are 22 rotating drafts after all. Fortunately, Delaplaine will pour you a three-beer flight for $8 or four for $11. 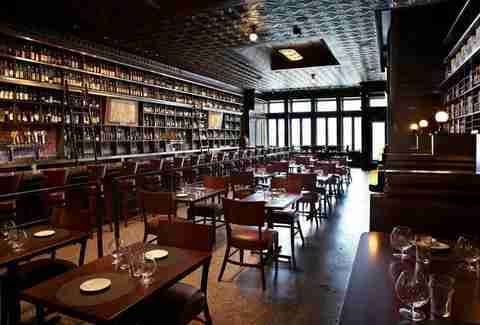 This bar is for people whose beer philosophy is based on sheer volume. 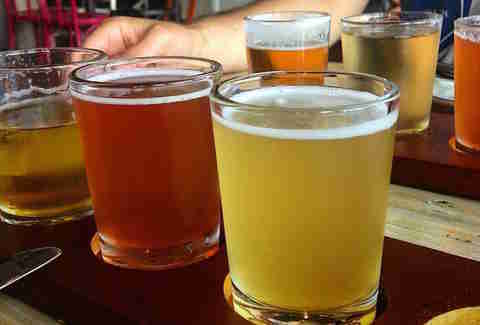 Go ahead, give them a Google, and you’ll see their slogan immediately: “We have 600 beers from around the world.” About 50 of these choices are available on draft, while the remaining options are bottled or canned and divided helpfully by style. While this is impressive, they’re sometimes out of selections, so choose to be flexible instead of an a-hole. The bacon lollipops are pretty good to snack on while perusing the list, just saying. You’re not going to be overwhelmed with volume at The Fainting Goat, but what drafts, bottles, and cans they do have are anything but boring. The 11 drafts include fun suds like New Holland’s Dragon’s Milk bourbon barrel stout and Natty Greene’s Buckshot amber ale out of North Carolina. Also keep an eye out for funky large-format bottles like Baltimore’s own Green Peppercorn tripel from Brewer’s Art. Expect a full range of beer styles at the Goat, but Beverage Director Ken Curry does have a preference. “The farmhouse saison style is a personal favorite, and I'm eagerly anticipating the arrival of the ginger saison by Peak Organic brewing from Portland Maine,” he tells us. Laura Hayes is a DC-based food, drink & travel writer who also contributes to Washington City Paper, Food Network, Edible DC, and others. She's really glad sour beers have shoved IPAs out of the way. Follow her @BTMenu.